"Don't let the grass grow under your feet!" Complete organic lawn care including soil analysis, mowing, trimming, dethatching, seeding and fertilizing. Spring and Fall cleanup including leaf removal. Roto-tilling, planting, weed control, complete organic care. 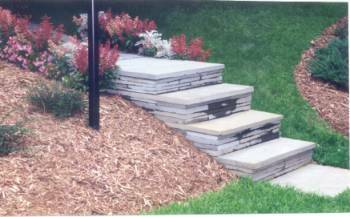 Shrubs, trees, flower beds, bulbs planted, ornamental grasses, mulching, decorative stone, water gardens, stone patios, rock gardens, walkways and walls. Mulch, topsoil, stone, gravel, call on special orders for other items. French drains, ditches, trees planted, small terracing. Decorative wood and vinyl fences, split rail and deer control fencing. Driveways and small parking lots. Email, Call or fax for scheduling the best lawn and garden maintenance today!